These give me mixed feelings, as tree removal projects have aroused lately elsewhere in Oakland. First, there’s the experience the trees provide. For one thing, you basically can’t walk here, so the colonnade is not a realistic attraction for walkers. Its main effect is a momentary diversion for drivers, who really don’t need one at this location. Second, there’s the effect on the surroundings. As you climb up in this valley, the trees emerge as a very tall fence that blocks the view of the hills and the city and the bay. Third, there’s the geologic setting. This part of the roadway runs along a very steep 40-degree slope through pure serpentinite, visible in the small landslide scar on the right side of the photo. Serpentine rock is poor footing for these massive trees. 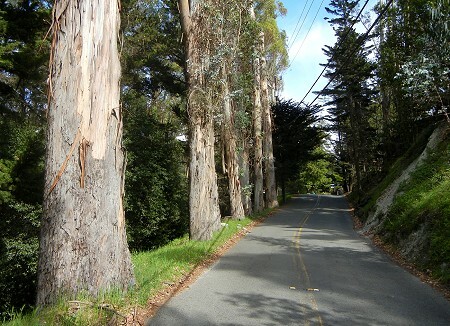 The trees may seem like they’re buttressing the roadway, but when they inevitably tip over in a storm or earthquake, they’ll uproot it instead, forcing the locals to drive up and down Ascot Drive for many months. But how about that rock? 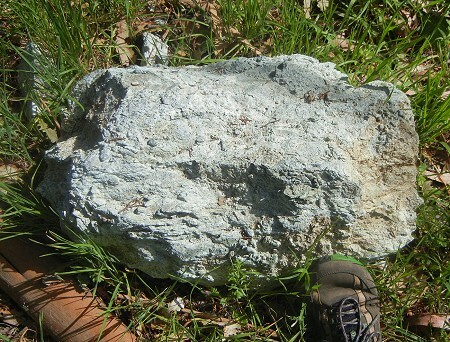 Here’s a hunk of it that spilled across the road. And here’s a hand specimen. I love this stone, but roadbuilders don’t. It’s not my problem, since I don’t live there, but I think the best thing to do is to turn this colonnade into a line of ground-level stumps. The root systems would bolster the soil for another decade or so, giving the city time to plan and execute a properly engineered roadway. And bollards set in the stumps would preserve the trees’ most useful current function of keeping cars out of the canyon. Trees are supposed to be wonderful stockpiles of carbon, sequestering it from the atmosphere. For me, that argument shouldn’t apply to individual trees or even individual groves of trees. What do we do, in the long run, with the carbon in treespile the trunks in pyramids? Carbon is best stored in the soil, where it provides excellent tilth and maintains a thriving ecosystem that resists fire and drought. It’s like circulating money in an economy: do you hoard it in vaults or spread it around among people ready to use it as a medium of exchange? Humans have spent thousands of years degrading the world’s soils, and I’d rather we begin to restore them. This entry was posted on 29 March 2015 at 7:14 pm and is filed under Oakland hazards, Oakland serpentinite, Other topics. You can follow any responses to this entry through the RSS 2.0 feed. You can skip to the end and leave a response. Pinging is currently not allowed. Amen. As familiar a sight as those trees are to people in the neighborhood, they are trouble waiting to happen. Anyone who remembers what eucalyptus groves did in the Oakland Hills fires knows what I’m talking about. The road there is very, very narrow, unsafe for bicyclists, walkers, and on a busy day, even the cars. The issue with our big Eucalyptus forests is that once you cut them down they tend to sprout back five-fold. I really don’t trust the City to do this job correctly. If you walk Leona Canyon behind Merritt college, I don’t think there is a non-native in site. I thought nothing would grow in a serpentine/ite soil. It depends. 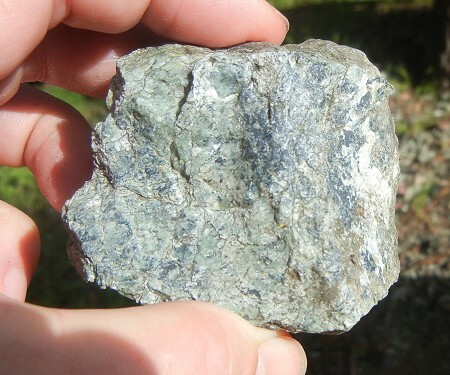 Pure serpentinite isn’t fertile on its own, but if nutrients are available some species can make a go of it. For instance, over the hill at Serpentine Prairie, dogshit and pine-tree droppings have altered the soil chemistry enough for noxious weeds and non-native grasses to take hold. The park is pulling out the trees and trying to manage the dogs with fences and posted signs. But last time I was there, on Monday, I saw people walking around with their dogs unleashed anyway.